Mechanism and Machine Theory, Volume 125, July 2018, Pages 137-145. Teaching design to non-designers is a popular way to drive innovative and creative thinking. However, very little is understood about the pedagogical approach. 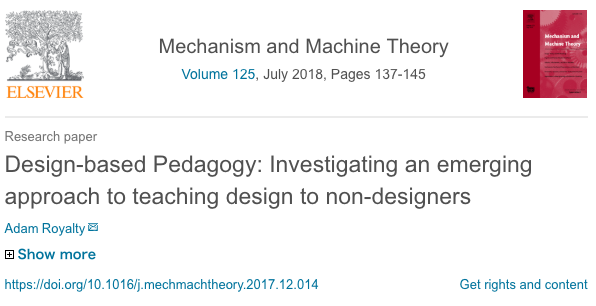 This paper presents a definition for Design-based Pedagogy and catalogs a list of corresponding variables collected through a survey of experienced design and design thinking instructors. We demonstrate that this learning environment is robust in comparison to a variety of educational frameworks. The variables identified can help researchers and educators better understand what supports engaging design education.